Does the legend of St. Urho have its source in the Kalevala? Richard Mattson passed away in June 2001. His story is reprinted here. Another claim to the origination of the St. Urho legend. St. Urho is said to have chased the grasshoppers out of Finland, thus saving the grape crop. The legend of St. Urho says he chased the grasshoppers out of ancient Finland, thus saving the grape crop and the jobs of Finnish vineyard workers. He did this by uttering the phrase: "Heinäsirkka, heinäsirkka, mene täältä hiiteen" (roughly translated: "Grasshopper, grasshopper, go to Hell!"). His feast is celebrated by wearing the colors Royal Purple and Nile Green. St. Urho is nearly always represented with grapes and grasshoppers as part of the picture. Saint Urho has been recognized with proclamations in all 50 states. Minnesota Governor Wendell Anderson issued a proclamation in his state, the unofficial home of Saint Urho, in 1975. We hope you enjoy our effort to honor this mythical Finnish-American hero. Please feel free to share your St. Urho experiences and celebrations by clicking on the phrase below and sending a note to the webmaster. Many communities in the United States, Canada, and other parts of the world hold festivals and parades in honor of Saint Urho's Day. Some of the better known are in Finland, MN; Finlayson, MN; Menagha, MN; Thunder Bay, ON; Butte, MT; Hood River, OR. There is another web site that catalogs St. Urho's Day activities each year, StUrhosDay.com, so we have decided to let them handle the annual list. Finland, MN, St. Urho page on Facebook. 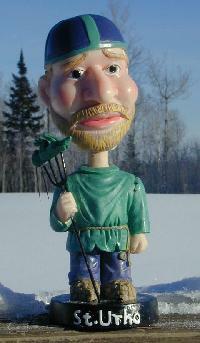 Share your Saint Urho's Day photos on Flickr. Was St. Urho a Failure? 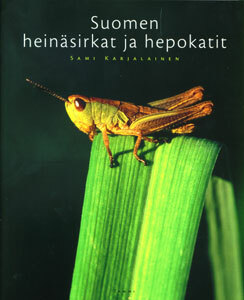 A book arrived in the mail recently at SaintUrho.com HQ that indicates the grasshopper population in Finland is thriving. The book is titled Suomen heinäsirkat ja hepokatit (The Grasshoppers and Crickets of Finland). Dr. Sami Karjalainen has written a 200 page book full of color photos of Finnish grasshoppers. The book includes a CD with grasshopper calls.